For every project, there are certain equipment that needs to be hired for the work. 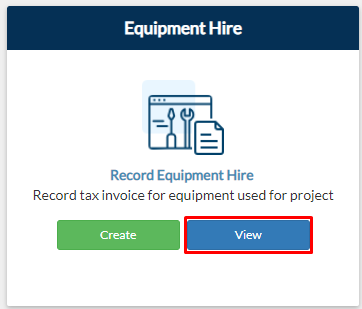 From your project page, go to Construction tab > View on Equipment Hire tile. From your projects dashboard, click the Reports button. Locate the Equipment Hire Report then click View Report. This can be found under All or Construction Phase tab. From your navigation bar, go to Management > Reports > Equipment Hire Report. Or type in 'Equipment Hire Report' on the search bar located on the upper right corner of your portal. 2. You will be redirected to Equipment Hire Report page where you can view all the submissions. Note: Project Name field is disabled if you are already inside the project. It will be blank by default and will only be enabled if you are outside your project. 3. Input filters if you are going to view a specific record. Click View Record. 4. A table will be displayed consisting the results based on the details you entered. Click Export to Excel if you wish to have a copy of the report written in an Excel file.